In 1908, Pringle first described a technique to minimize blood loss during hepatic surgery by clamping the vascular pedicle (now commonly known as the Pringle maneuver). 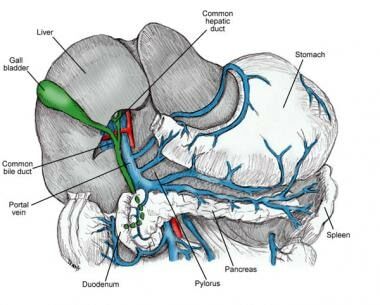 The inflow of blood to the liver is via the hepatic artery and portal vein (see the image below). Surgeons must be able to isolate and control these sources of blood flow to control bleeding not only in traumatic injuries to the liver but also in elective hepatic resections. Traumatic injury to the liver can result in massive hemorrhage. Intraoperative blood loss is a major determinant of perioperative outcome. Temporary control of hemorrhage is important in terms of buying time while the anesthesiologist restores the circulating volume before further blood loss occurs. It also allows time for repair of other injuries that may be of higher priority without unnecessary blood loss. Once patients are stabilized, they may be taken back to the operating room for definitive procedures. Ongoing bleeding may be controlled by this maneuver. If hemorrhage continues after this technique, hepatic bypass is an option. However, it may be more appropriate to perform damage-control laparotomy and tightly pack the liver. This will allow for continued resuscitation and stabilization. The surgeon may return at a later time to reexplore and perform definitive repair. Inferior vena cava (IVC) injuries can be lethal and difficult to isolate and repair. If the IVC is actively bleeding, exploration is warranted. When the right hemiliver is mobilized, an active rush of blood indicates an injury to the right or left hepatic vein. If there is a large retroperitoneal hematoma, then a retrohepatic vena cava injury is likely. Pringle JH. V. Notes on the Arrest of Hepatic Hemorrhage Due to Trauma. Ann Surg. 1908 Oct. 48 (4):541-9. [Medline]. Burch J, Moore E. Injuries to the liver, biliary tract, spleen, and diaphragm. Souba WW, Fink MP, Jurkovich GJ, Kaiser LR, Pearce WH, Pemberton JH, et al, eds. ACS Surgery: Principles and Practice. 6th ed. New York: WebMD; 2007. 1304-17. Cameron JL, Cameron AM, eds. Current Surgical Therapy. 12th ed. Philadelphia: Elsevier; 2017. 1169, 1178, 1211. Lee KF, Cheung YS, Wong J, Chong CC, Wong JS, Lai PB. Randomized clinical trial of open hepatectomy with or without intermittent Pringle manoeuvre. Br J Surg. 2012 Sep. 99 (9):1203-9. [Medline]. Grazi GL, Mazziotti A, Jovine E, Pierangeli F, Ercolani G, Gallucci A, et al. Total vascular exclusion of the liver during hepatic surgery. Selective use, extensive use, or abuse?. Arch Surg. 1997 Oct. 132 (10):1104-9. [Medline]. Lekawa ME, Hoyt DB. The abdomen. Gracias VH, McKenney MG, Reilly PM, Velmahos GC, eds. Acute Care Surgery: A Guide for General Surgeons. New York: McGraw-Hill; 2009. 367-84. Tieu BH, Zhou M, Trunkey DD. Abdominal vascular injury. Flint L, Meredith JW, Schwab CW, Trunkey DD, Rue L, Taheri PA, eds. Trauma: Contemporary Principles and Therapy. Philadelphia: Lippincott Williams & Wilkins; 2008. 451-62. Imamura H, Kokudo N, Sugawara Y, Sano K, Kaneko J, Takayama T, et al. Pringle's maneuver and selective inflow occlusion in living donor liver hepatectomy. Liver Transpl. 2004 Jun. 10 (6):771-8. [Medline]. Takatsuki M, Soyama A, Hidaka M, Kinoshita A, Adachi T, Kitasato A, et al. Prospective study of the safety and efficacy of intermittent inflow occlusion (Pringle maneuver) in living donor left hepatectomy. Hepatol Res. 2015 Aug. 45 (8):856-62. [Medline]. Zhu P, Lau WY, Chen YF, Zhang BX, Huang ZY, Zhang ZW, et al. Randomized clinical trial comparing infrahepatic inferior vena cava clamping with low central venous pressure in complex liver resections involving the Pringle manoeuvre. Br J Surg. 2012 Jun. 99 (6):781-8. [Medline]. Zhao R, Liu F, Jia C, Chen K, Wei Y, Chen J, et al. Hepatic Pedicle Occlusion with the Pringle Maneuver During Difficult Laparoscopic Cholecystectomy Reduces the Conversion Rate. World J Surg. 2018 Sep 28. [Medline]. Dua MM, Worhunsky DJ, Hwa K, Poultsides GA, Norton JA, Visser BC. Extracorporeal Pringle for laparoscopic liver resection. Surg Endosc. 2015 Jun. 29 (6):1348-55. [Medline]. Piardi T, Lhuaire M, Memeo R, Pessaux P, Kianmanesh R, Sommacale D. Laparoscopic Pringle maneuver: how we do it?. Hepatobiliary Surg Nutr. 2016 Aug. 5 (4):345-9. [Medline]. [Full Text]. Laurenzi A, Cherqui D, Figueroa R, Adam R, Vibert E, Sa Cunha A. Totally intra-corporeal Pringle maneuver during laparoscopic liver resection. HPB (Oxford). 2018 Feb. 20 (2):128-131. [Medline]. Inoue Y, Suzuki Y, Fujii K, Kawaguchi N, Ishii M, Masubuchi S, et al. Laparoscopic Hepatic Resection Using Extracorporeal Pringle Maneuver. J Laparoendosc Adv Surg Tech A. 2018 Apr. 28 (4):452-458. [Medline]. Lim C, Osseis M, Lahat E, Azoulay D, Salloum C. Extracorporeal Pringle Maneuver During Laparoscopic and Robotic Hepatectomy: Detailed Technique and First Comparison with Intracorporeal Maneuver. J Am Coll Surg. 2018 May. 226 (5):e19-e25. [Medline]. Donadon M, Molinari AF, Corazzi F, Rocchi L, Zito P, Cimino M, et al. Pharmacological Modulation of Ischemic-Reperfusion Injury during Pringle Maneuver in Hepatic Surgery. A Prospective Randomized Pilot Study. World J Surg. 2016 Sep. 40 (9):2202-12. [Medline].